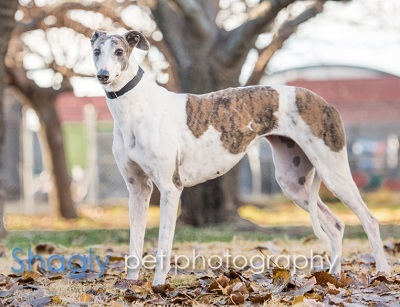 Scarlett is a 6 year old white and brindle female born in May 2012. She was part of the population from the blood bank facility located in Cherokee, TX that closed in November 2017. Scarlettt has completed her medical evaluation and all of her medical procedures by GALT's veterinarians. She is ready to find her forever family. It is not yet known if she is small animal or cat tolerant. Please check back periodically for updates on Scarlett. Scarlett is one of those rare dogs that is just so sweet that one look into her eyes and you will fall in love with her. Scarlett is a very shy girl especially around strange noises and new people. When Scarlett is around our pack of 6 dogs, and they are all out back, her personality really begins to shine. She runs and plays with the others and barks at all the bunnies she sees. Scarlett had an incident with the create that scared her, and she doesn’t really like to go in it anymore. Scarlett never needed it anyway because she has excellent house manners, and has never had an accident. She stays out roaming the house with the others while we are gone and has never chewed up anything. Scarlett loves bananas and always has a large appetite when it’s feeding time. Due to her shy, timid, and scared nature, we are still working on leash training. When walking on a leash if she sees or hears something unusual she may freeze up and not move. During her time with us she has really started to come out of her shell and is building confidence every day. Scarlett spends most of her time in our bedroom but is venturing out more and more to see what we are doing. Due to how truly different and alive she is around just our dogs and her timid ways on a leash Scarlett’s ideal forever home would be one with a backyard and at least one other dog. With lots of love and a little time from her family, she will soon be wanting love and attention all the time. Scarlett is so sweet, and her fur is so soft, when she walks up and puts her head on you for attention your heart will melt, and you won’t be able to resist her. Scarlett has not been tested with cats or small dogs, though she is wonderful around our 7 yr old daughter. Even when Scarlett is super scared she has never once shown any signs of aggression. 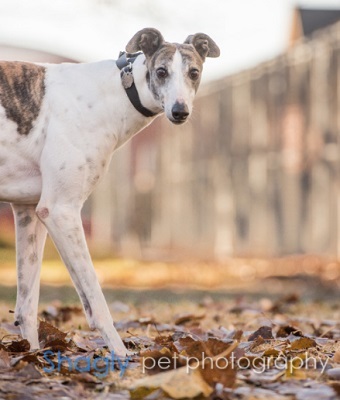 Come out and meet this white and brindle beauty, your heart will skip a beat as well.